The car rental market after facing several issues and bumpy road in past decade started to revolutionize on the back of new technologies and digitization. Growing number of smartphones and development of electric and autonomous vehicles are some of the major areas to study when it comes to the predicting the future of global car rental market. Advancement in technology has already made a significant impact on the car rental market as it gives consumers more control over the services and it also play vital role in changing market opportunities. The report covers the present ground scenario and the future growth prospects of the car rental market for 2016-2024 along with the total revenue of car rental in every region. We calculated the market size and revenue share on the basis of revenue generated from the car rental services providers and total number of transaction made by commercial and individual users. The revenue forecast is given on the basis of number of service providers and current growth rate of the market. 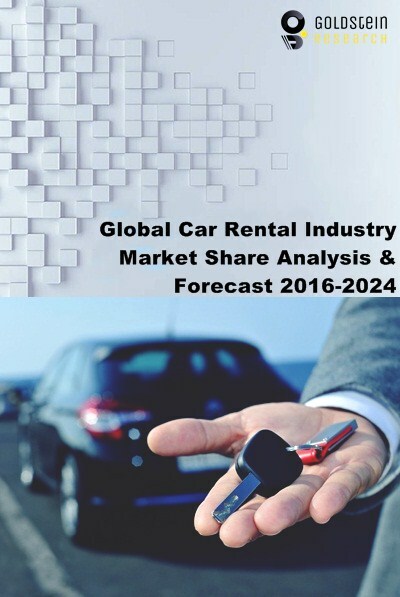 Global Car Rental Market Report has been prepared based on an in-depth market analysis from industry experts. The report covers the competitive landscape and current position of major players in the global car rental market. The report also includes porter’s five force model, SWOT analysis, company profiling, business strategies of market players and their business models. Global car rental market report also recognizes value chain analysis to understand the cost differentiation to provide competitive advantage to the existing and new entry players. This report comprises of the following companies as the key players in the global car rental market: Rent-A-Car, Hertz Global Holdings, Inc., Avis Budget Group Inc., Europcar Groupe S.A., Sixt AG., Carzonrent, Enterprise Holding, Uber, OLA, LYFT, Hailo, Grab Taxi, Didi Dache, Gett, LeCAb, cabify. Based on bookings online segment accounted for the highest revenue share of more than 70% in global car rental market owing to the ease of bookings and payment methods. Offline bookings are expected to decline by 15% over the forecast period as small and medium market players will provide their services through online methods. Goldstein Research analyst forecast the global car rental market to expand at a CAGR of 5.7% during the forecast period 2016-2024 and reach the valuation of USD 85.1 billion by 2024. Geographically, North America accounted for the largest market share with more than USD 40% revenue share owing to the. On the other hand Asia Pacific region is the fastest growing region growing and is likely to expand at a CAGR of 6.2% over the forecast period i.e. 2016-2024. China, India and Indonesia are the fastest growing markets in the region, collectively accounting for more than 50% market share in Asia-Pacific car rental market. According to our global car rental industry study on the basis of extensive primary and secondary research, one major trend in the market is technological advancements. Car rental service providers are now able to take advantage of internet which enables them to provide new distribution channels, ease of bookings and door step services. Technological advancement also provided the car rental operators the ability to provide services which include self-service kiosk, online check-in, loyalty programs among others to make the rental process faster and smoother. According to the report, major driver in global car rental market is growing inbound and domestic tourism flows across the globe. Governments in many regions are also providing the driving privileges for foreign tourists, making them eligible for driving a vehicle across the country with valid driving license and passports. Such favorable regulations and rising number of foreign tourists across major geographies has significantly driven the self-driving car rental market. Further, the report states that one challenge in global car rental market is intense competition from the well-established major players in the industry. Averagely, around 60% of the car rental market share is majorly acquired by the 3-4 big market players across the different geographies of the world. Lower fare of public transport is also the major challenge for car rental market. For a full detailed overview, send us request for market report sample. What is the total adoption rate in 2015-16 and what would be the expected adoption rate over the forecast period?